As you know, I've reviewed Panera bagels many times before. I'm not much of a bagel eater in general, but, I do actually like some of Panera's bagels. 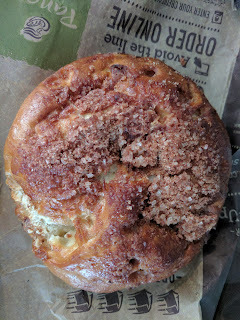 Panera's bagel collection includes the basics (plain, sesame, everything, whole wheat), the savory (asiago cheese, jalapeño cheddar), the slightly sweet (blueberry, chocolate chip, cinnamon swirl & raisin), and the decadent (french toast, cinnamon crunch), and an occasional seasonal special (Pumpkin Pie!). The whole wheat are a great hearty choice and perfect for transforming into a savory dinner option with toppings, and some of the decadent sweet bagels can make a nice dessert, particularly if you, uh, waffle them (stay tuned!). The rest are fairly boring, more like bread than bagels, but, I've tried them all at this point. In full disclosure, I tried them all because my Panera account was targeted with a "Free Bagel Every Day" promotion, and you know I can't resist my freebies. For most of my orders, I used the Panera app, or ordered online, which was generally easy, except for the fact that the app regularly didn't reflect reality of what they had in stock, so, I'd order something, and then it wasn't available, so the entire "Rapid Pick-Up" feature would fail, as I'd arrive, find nothing for me, and need to go inquire about it. I discovered the biggest issue is that they allow you to set a pickup time in the future - later that day, or even up to two weeks later. This is great (particularly if you are trying to redeem a free bagel every day ...), but, after talking with a store manager, I learned that the order doesn't get sent to them until 10 min before the pickup time. So even if you order two weeks in advance, and really want a blueberry bagel, you aren't actually reserving it in any way. This system could use some tweaking. The store was always apologetic, but I learned I couldn't menu plan around counting on a bagel being available. When you order online, there are 3 options for "Toast & Slice" customization: "Unsliced", "Sliced & Toasted", and "Sliced in Half". The first two are pretty self explanatory. I thought the third was as well. I always picked up my bagel intending to bring them home and have later, toasted and topped as I pleased (or, thrown into the freezer). I wanted to make it easy on myself, so I opted to have them sliced in half. I expected that this meant slicing the way you would slice if you were toasting a bagel and/or putting on a spread. It turns out ... there was no consistency in how this was interpreted. Seeing exactly *how* the "slice in half" was done became a major source of amusement for me. Again, note, I wasn't requesting anything special, you can select "Slice in half" when you order online, or through the app, or on the kiosk at the store. Panera doesn't break the bagels up into categories, but, I do. I consider the "basics" the flavors you can expect at basically any bagel shop or cafe: plain, sesame, everything, and whole wheat. Panera prices these at $1.25, while the other varieties are more expensive, so, at some level I guess they do distinguish. 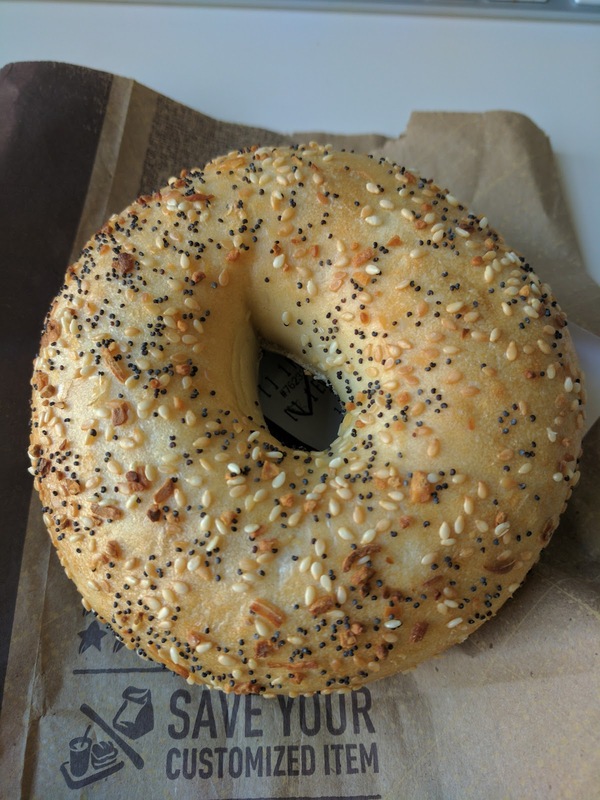 "Freshly baked bagel topped with sesame seeds, poppy seeds, garlic, toasted onion and kosher salt." This is a standard Panera bagel. Large, doughy. The toppings are kinda mediocre; there are some poppy seeds, sesame seeds, bits of garlic, and onion, but, none really stand out and the quantity isn't particularly impressive. The standard bagel is $1.25 (with no spread or just butter). In this next installment of "sliced in half", we have ... sliced in the dimension I intended at least, but, still connected, not cut through, and totally uneven. Isn't slicing bagels kinda a core practice at Panera? Whole Grain Bagel, Sliced in Half. $1.25. Next I went for my previous favorite, the whole grain. And ... victory! It was sliced in half the right way AND it was sliced evenly AND all the way through. I knew they could do it! I got this on a day when I went to a chocolate festival, and spent hours walking around eating chocolate of all varieties: milkshakes, hot chocolate, ice cream sundaes, chocolate marshmallows, chocolate mousse ... let's just say I needed something to uh, soak up all the chocolate. I certainly didn't want anything sweet. I ate the top half as-is. Not toasted. No spread. I really needed something simple! 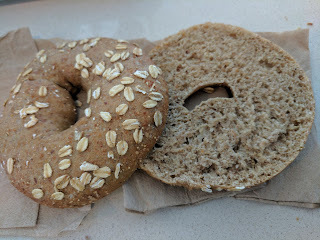 The bagel had a bit of sweetness to it, as it is sweetened with honey, but mostly it was fairly hearty tasting (oats, rye, spelt, barley, amaranth, flax, and more are actually in there), and was what I needed. 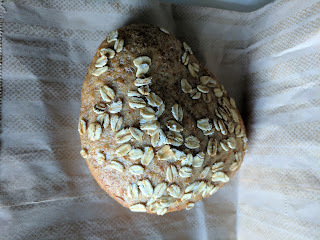 It was soft and I liked the oats on top as before, they added to the healthy taste. It would make a nice dinner roll. As with other "basic" bagels, this was $1.25. Whole Grain Bagel, Cream Cheese, Onions, Sweet Red Peppers, Herb Mix. The other half I turned into a savory creation. I used to make savory bagels for lunch/dinner all the time when I was in grad school. I had a specific recipe: I'd start by toasting the bagel. While it was toasting, I'd chop up onions and bell peppers. After a light toasting, I'd add a layer of cream cheese, slices of sharp cheese, my veggies, and dried herbs. Under the broiler it would go to melt the cheese and cook the veggies. Sorta like pizza, but with cream cheese instead of tomato sauce, and with far nicer cheese. 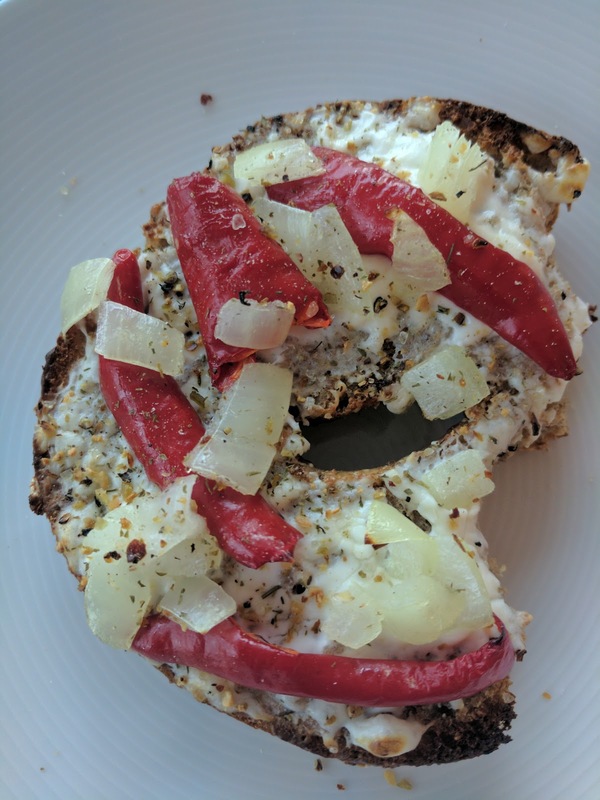 I forgot about these bagels for years, until I had this whole wheat bagel, and happened to have cream cheese, onions, and peppers on hand. I didn't have any good cheese, but it was pretty tasty without. A nice savory bagel. Sorry, this has nothing to do with Panera at this point I realize, but, it was a fun memory for me. Sprouted Grain Bagel Flat, Sliced in Half. $1.49. 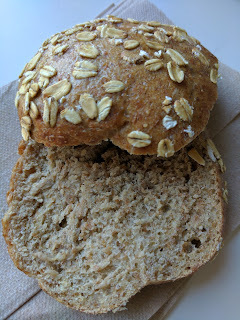 "Freshly baked bagel, pinched and slightly flattened, made with select ingredients, including sprouted wheat, rye, spelt and oats mixed with whole wheat flour and a touch of honey, then topped with oats." 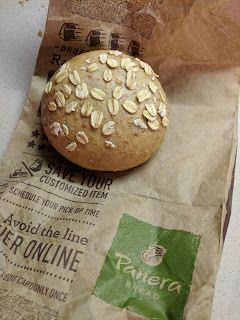 In addition to the Whole Grain Bagel, Panera also makes a "Sprouted Grain Bagel Flat", also made with a mix of whole grains and topped with oats, and a "Sprouted Whole Grain Roll", made with a mix of whole grains and topped with oats. I'm amused by the naming as one is "whole grain", one is "sprouted grain", and one is "sprouted whole grain". I'm seriously guessing these are all about the same ingredients. Anyway. I decided to try the bagel flat, to compare with the regular whole grain bagel. It seemed *much* smaller than a bagel, which made me originally question if I got the roll instead. It does look like Sprouted Grain Bagel Flat I got in a breakfast sandwich once before, just, smaller. Anyway, I'm not sure why this is branded as a bagel. "pinched and slightly flattened" really doesn't describe it. "pinched" implies that it would still have at least an element of a hole? This was a solid roll. No question about it. It also didn't really seem that flat, although, I guess, "slightly flattened" isn't *that* flat. Anyway. It was a good roll. 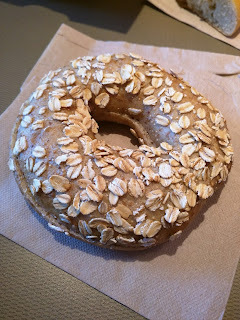 It was basically just like the whole grain bagel, just with no hole, smaller size, and perhaps a bit more oats on it. Sprouted Grain Bagel Flat, $1.49. Since I liked the bagel flat before, I got another, and treated it much like the whole grain bagel above,, topping with cream cheese, onions, peppers, and herbs, except this time I also used some amazing sharp cheese. The form factor of the flat was better since it had no hole, so I was able to slice it in half and add slices of cheese without the cheese falling into the hole. It was crazy delicious. This bread, er, bagel, just has so much heartiness and flavor to it, that melting on some awesome cheese and sprinkling with herbs made for something ridiculously satisfying, albeit simple. 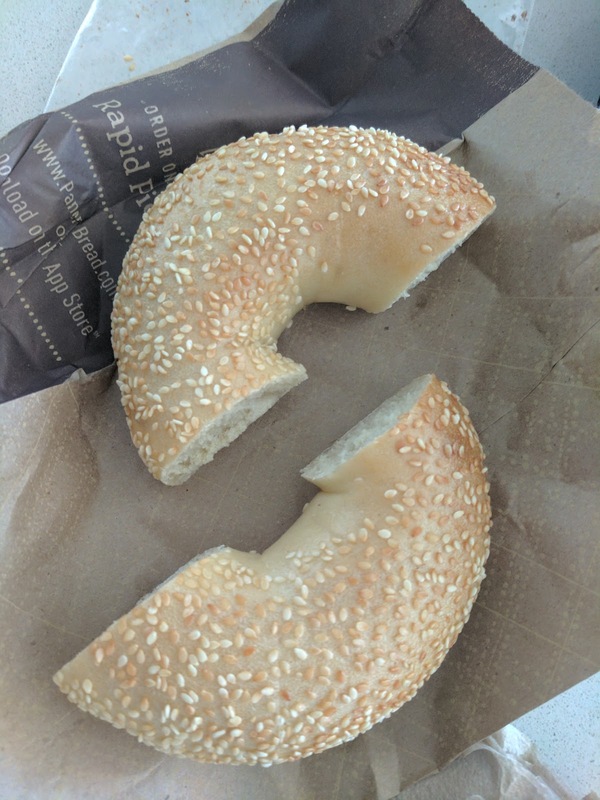 Sesame Bagel, Sliced in Half. $1.25. "Freshly baked bagel topped with nutty sesame seeds." I laughed when I pulled the bagel out out the bagel. Technically, it *was* sliced in half, but, why would anyone want it this way? This was a simple sesame bagel, not much notable about it (bready, plain, Panera bagel with some seeds on top), but, the "sliced in half" was done in a far less practical way. Lols. The next category I call "slightly sweet", and are again fairly basic flavors you can expect to find anywhere: blueberry, chocolate chip, cinnamon swirl & raisin, but are priced slightly higher at $1.49. 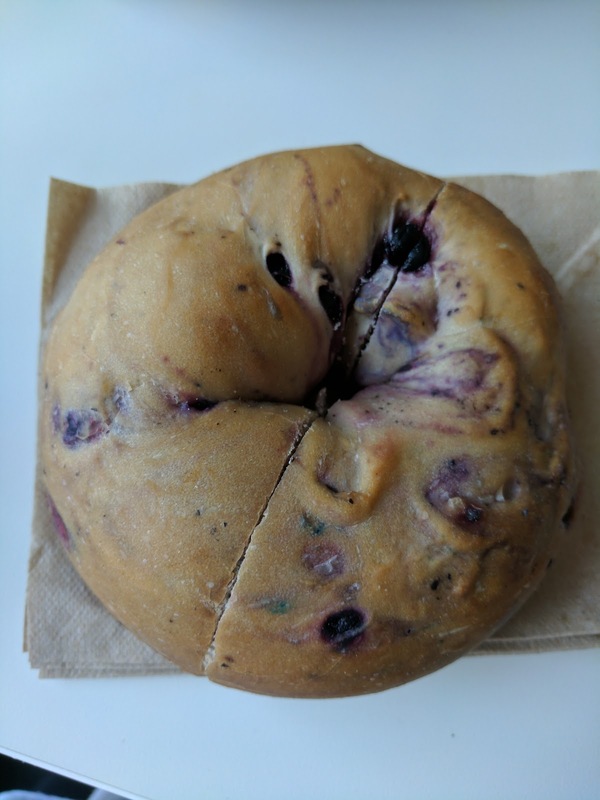 Blueberry Bagel, Sliced in Half. $1.49. "Freshly baked bagel made with a mix of wild and cultured blueberries baked inside." Another amusing interpretation of "sliced in half". I tried a bite immediately to best evaluate the bagel itself. 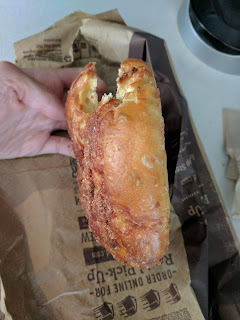 It had a nice shine to the outside, a tiny bit of a crust, making it pleasant to bite into, even sans toasting. Inside was fluffy and bread-y. It had a decent distribution of berries, which added good flavor. Overall, a decent enough blueberry bagel, and I'd get another if I really wanted. However, I was pretty unimpressed. 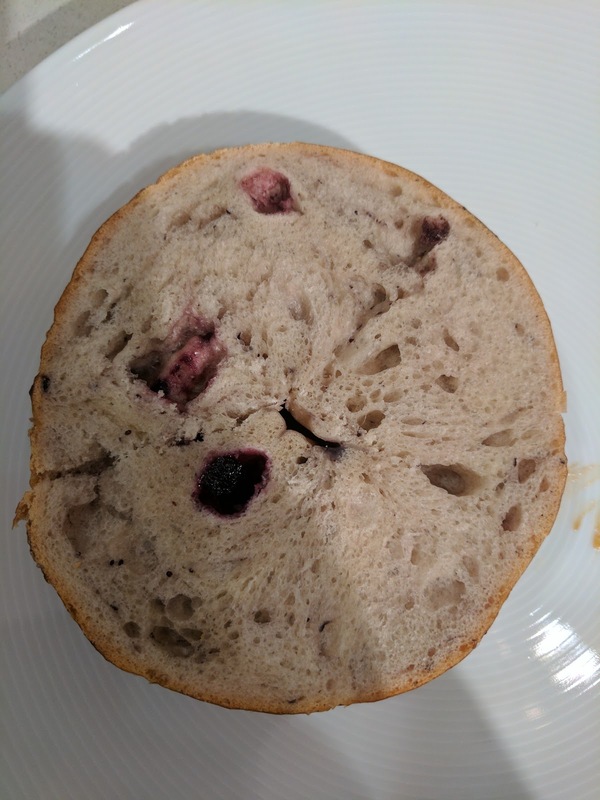 My bagel had ... one blueberry in this entire half! The entire bagel also tasted very fake, like a blueberry candy. I topped it with butter and sugar, and hoped for the best, but, I still did not enjoy it. Now, I won't get another. Two strikes and you are out, Panera! 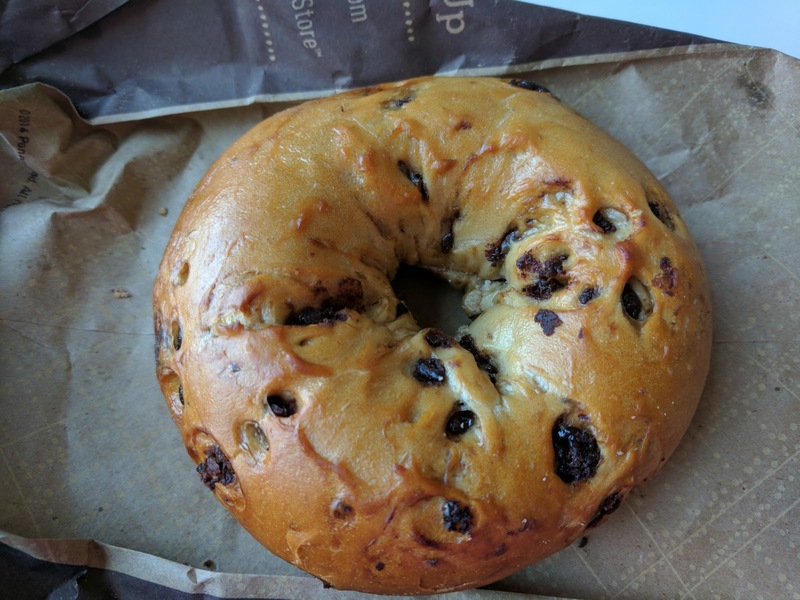 "Freshly baked bagel made with milk chocolate flavored chips." Chocolate and breakfast baked goods are not things that normally consider together. Which I know sounds strange, given that I love baked goods, have no trouble eating sweets for breakfast, and often have a piece of chocolate alongside my morning coffee. 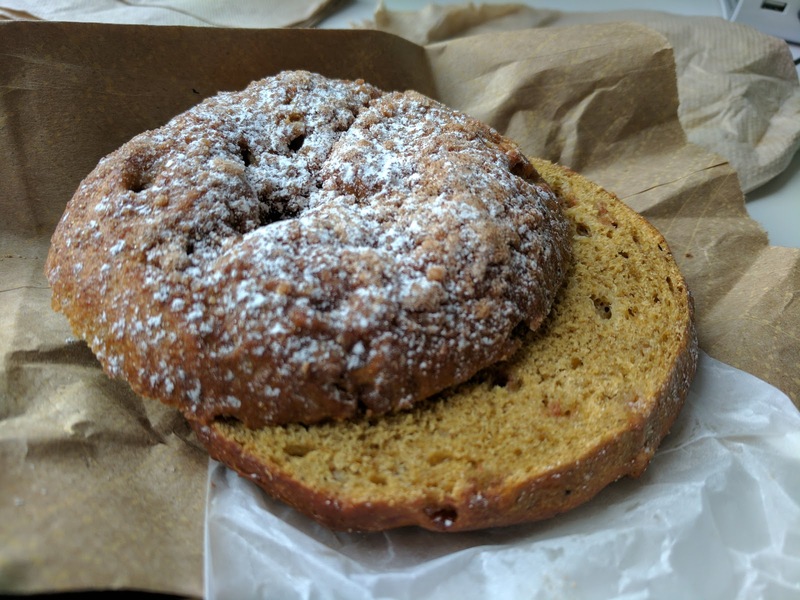 But for some reason, I just rarely go for chocolate muffins (although the one from Danbury Country store was good but the banana chocolate muffin from Costco, not so much), and I really disliked the chocolate chip pancakes from IHOP as a breakfast item. 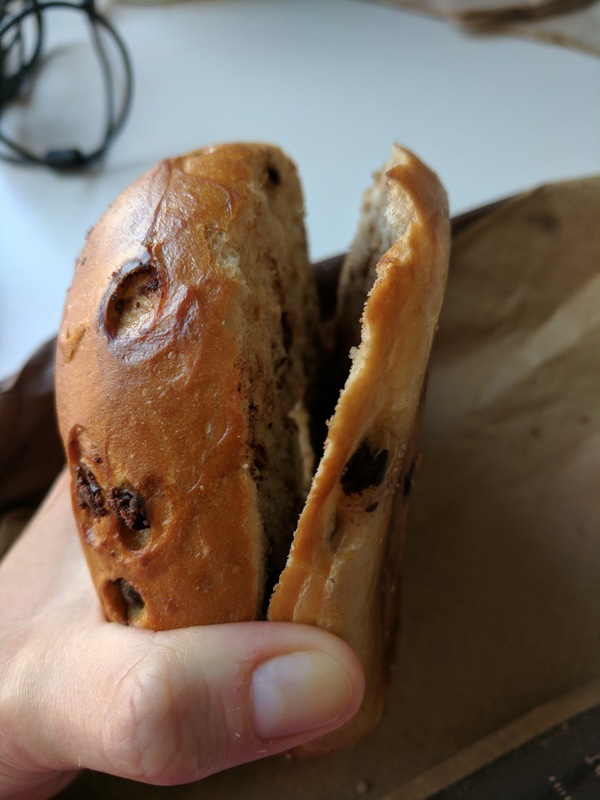 So it took a long time for me to want to try a chocolate chip bagel. It just isn't in the realm of things that make sense to me. 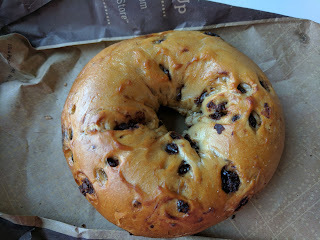 Anyway, eventually I decided to try the chocolate chip bagel. I thought it might be tasty warmed up so the chips got all melty, and with a thin layer of melty peanut butter on top, a la peanut butter cup. Or with a little Nutella? Oh, and in today's installment of #slicedInHalf, we have a bagel sliced 70/30? Next up, savory: asiago cheese and jalapeño cheddar, although the later is discontinued. These are the same price as the sweets, $1.49. Cheddar & Jalapeño Bagel. $1.49. "Filled with jalapeños, sharp cheddar cheese, and a blend of salsa spices mixed in roasted corn flour dough." 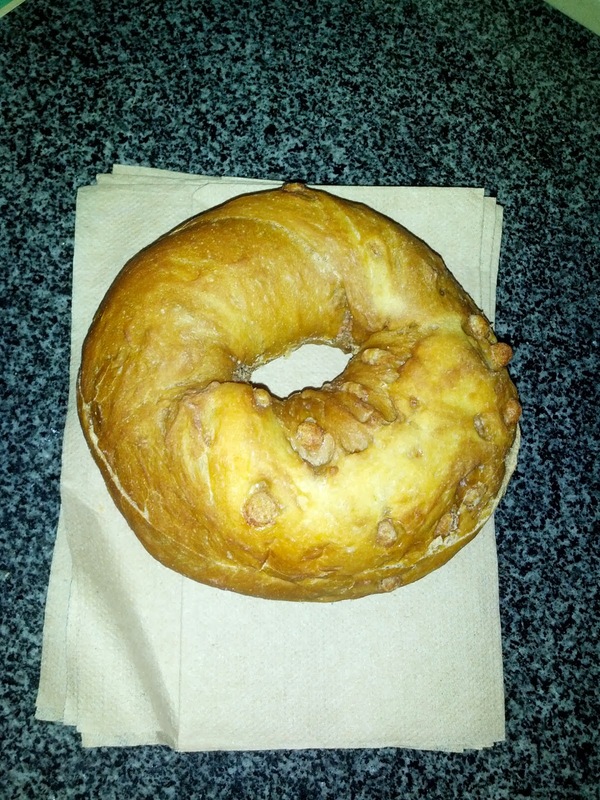 This bagel was introduced in summer 2015 as a limited summer item. Most Panera shops discontinued it after that summer. It no longer appears on their website. But my Panera still carries it. I thought it would make for a good base for pizza bagels, a favorite easy dinner of mine, so, I ordered one. Of course, I tried a bite before pizza-fying it. It was ... not great. It seemed a bit over-cooked, which you can kinda see here in the photo, it was darker than most. The crust was harder, it wasn't a fluffy. It did have some cheese pockets, and jalapeño bits, but, it really was just a kinda hard chunk of seasoned cheesy bread. Of course, I know you are curious how this "sliced in half" turned out. The answer? Um, not fully sliced in half. While previous attempts had resulted in the bagels still being partially connected, this one was only sliced through about half way. Getting bagels sliced in half is my new source of amusement in life. I know, sad life. And lastly, the collection I've dubbed decadent, basically, dessert bagels: french toast and cinnamon crunch. Pumpkin Pie Bagel, Sliced in Half. $1.49. But, alas, I arrived at 4pm, and, sure enough, they were basically out of bagels. 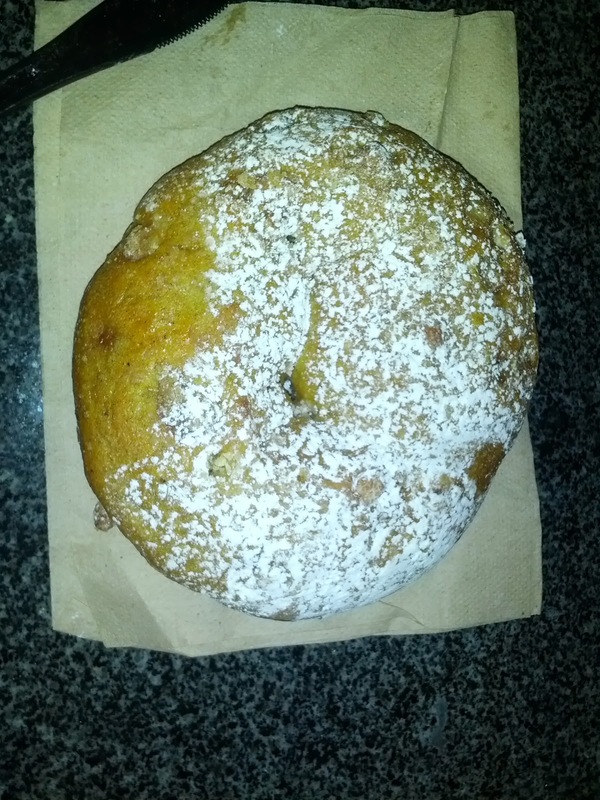 They had one single bagel remaining: the seasonal special, pumpkin pie. I recalled not thinking it was great before, and it certainly wouldn't work for a pizza bagel, but, I had bagels on the mind, so, I got it. I tried a bite untoasted and without toppings and ... it wasn't bad. It was soft, nicely spiced, and pumpkin-y. The top had crumble and powdered sugar, making it definitely very sweet, and not at all what I should eat for dinner. The bottom also had sugars caramelized all around it. I brought the rest home, and did something kinda crazy with it. 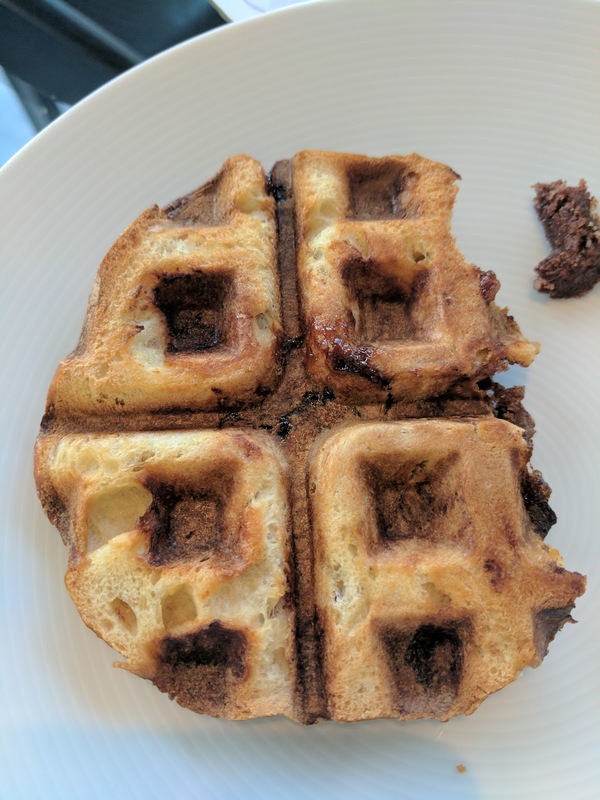 I took the top, and decided to cook it in my waffle maker. That is, rather than toast it, I just literally put it in the waffle maker. As you may know, I kinda love waffling random things. It was a crazy success. I didn't take a photo, but, wow, it worked. All the sugar and crumble on top got super caramelized. The bagel mushed down and crisped up, sorta like a bagel chip, but still a bit more doughy inside. I made a dip of equal parts whipped cream and cream cheese, and dunked my hot, caramelized bagel chips into it. So good. How have I never thought of waffling bagels before? 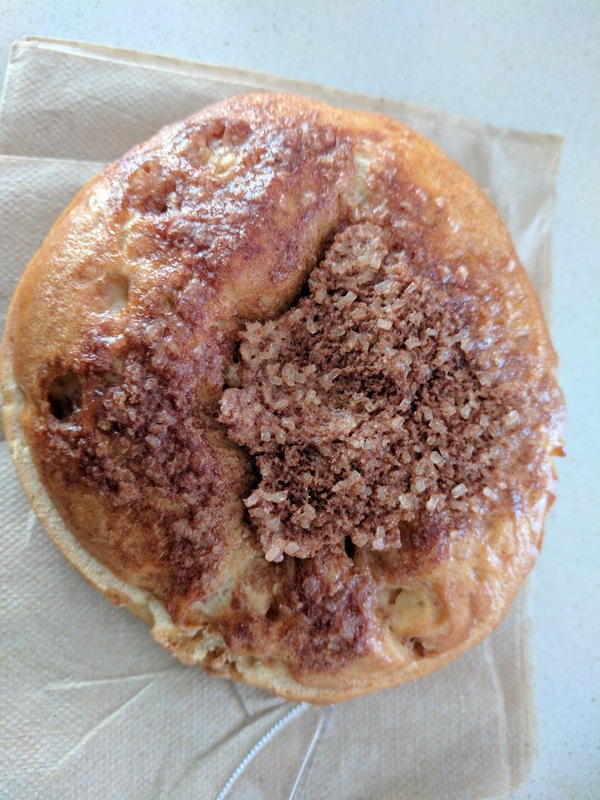 "Freshly baked bagel made with cinnamon and vanilla flavored chips to flavor the dough and topped with a sweet, crunchy shell of cinnamon and sugar." This turned out to be my absolute favorite bagel. It shouldn't surprise you that it is also the least healthy bagel Panera sells. By far. A plain bagel is 290 calories, 1.5 g fat, 3 g sugar. Not so bad. Sesame, everything, whole grain, cinnamon raisin, etc aren't much worse. The rest hover around ~350 calories (asiago is 330, blueberry is 340, cherry vanilla 360, french toast 350, and so on). But this beast? 430 calories. 7 g fat, 32 g sugar. Yup. And why? Cuz its delicious! I tried it first at room temperature and was very impressed. Soft, fluffy bagel base, good cinnamon flavor. But the top of this thing is what blew me away. It was just absolutely crusted and coated in cinnamon and large chunks of sugar. Delicious. I quickly toasted a chunk, as I could tell it would be even better warm. It was. Then I added butter, which, was also great, but actually unnecessary. The top of this thing was like a magic combination of a cinnamon roll, cinnamon bread, and, I guess a bagel? 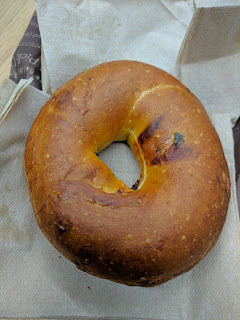 Although really, there wasn't much "bagel" about it, it didn't even have a hole. The bottom half was less exciting as it didn't have the cinnamon and sugar coating, but, it did still have cinnamon and sugar flavors throughout, as it was studded with the cinnamon chips. And, the edges of this were all caramelized too. This was good at room temp, great warmed up, and I bet would be even better waffled! And, yup, I asked to have it sliced in half. This one did have a slice, but, it most certainly wasn't in half, and it wasn't cut through. I liked the cinnamon crunch so much that I got it again. This one had a much less substantial crust on it. It still had plenty of ridiculous topping, don't get me wrong, but it only covered about half the top (the center), rather than extending down the sides. This time I took my own advice, and, just like the pumpkin pie, I waffled it, rather than toasting it. It worked great! The cinnamon coating formed a glaze on that side, and it collected pockets of butter just like, well, a waffle. Highly recommended. "Freshly baked roll made with sprouted whole grain." One time I visited and ordered a whole wheat bagel through the app before I arrived. Except, when I got there, they didn't have any. 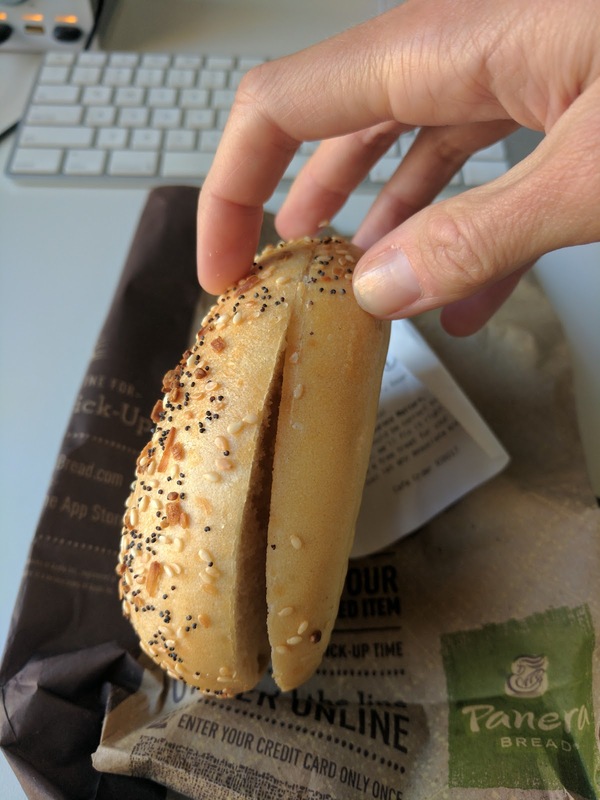 So I asked for the bagel thin. Nope they didn't have those either. I wanted a savory bagel, and the only remaining options were sweet. The staff member asked if I wanted a roll instead, and said it was basically the same. So I got it instead. It was ... well, a roll. I know Panera bagels aren't particularly authentic bagels, and they don't have that great of a boiled crust on them, but this was clearly just a roll. The dough may have been the same, but, I think it was baked differently. It was a fine roll, I liked the hearty flavor and the oats on top, but there was no mistaking it for a bagel. If you didn't read my original Panera bagel review, I suggest you start there, and then return to this update, since I'm skipping the background this time around. See "Original Review, April 2014" below. 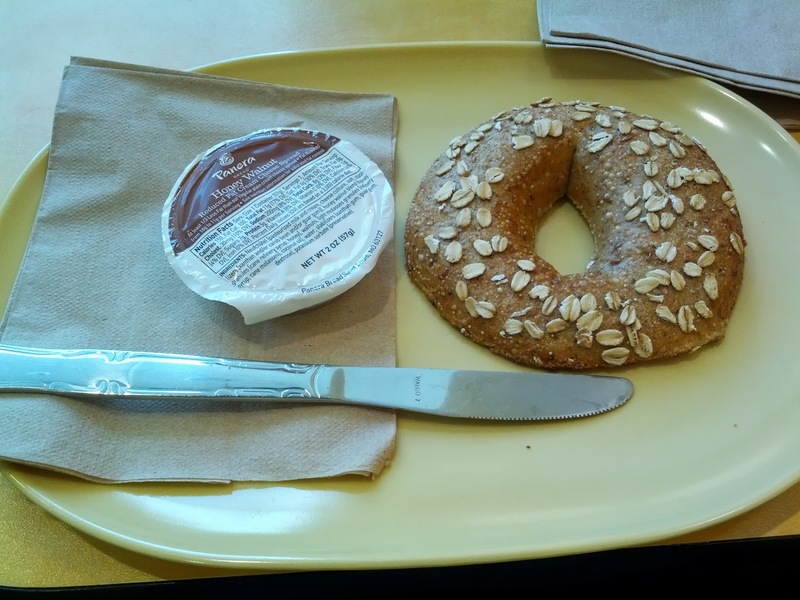 "Freshly baked bagel made from whole spelt flour, millet, flaxseed and other wheat flours, sweetened with honey and topped with rolled oats." For some reason, I didn't love my bagel this time, even though it was my absolute favorite last time. The bagel was fine, I liked the oats on top, but, I think I screwed up with my toppings. This was really a tragedy, as I opted to get not one, but two different cream cheeses (I couldn't decide!). 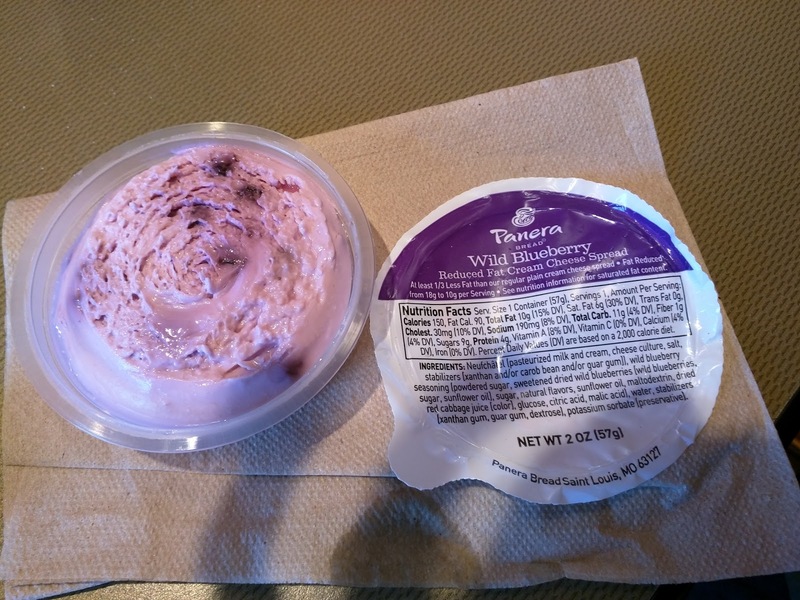 I love the Panera flavored cream cheeses. I like this bagel. But combined? It just didn't work. I kept just wanting simple butter (and honey) to accent the healthy, hearty nature of the bagel, not flavorful cream cheese. Wild Blueberry and Hazelnut Cream Cheese. $1.39 each. 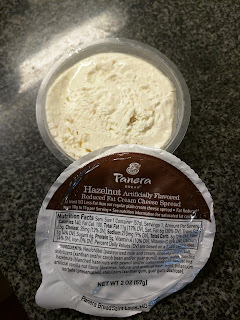 I couldn't make up my mind about what flavor of cream cheese I wanted to try with my bagel. I knew the tubs were only 2 ounces anyway, which, yes, is enough for a full bagel with no problem, but I like to slather it on pretty generously. Bagel == excuse to eat cream cheese after all. Plus, I knew I could save extra, so, I went for two: wild blueberry because I'd never tried it, and hazelnut, as I had a vague memory of liking it before. I really wanted the cheesecake flavor, but alas, they didn't have it. Panera's cream cheese is decent. Always quite soft and spreadable, not quite like the "whipped" cream cheese you can buy that is really fluffy and airy, but also not hard to spread without destroying your bagel like basic cream cheese. It was a beautiful purple color, and loaded up with tiny little blueberries. The flavor was decent. It didn't scream "OMG BLUEBERRY! ", but you could tell what it was. I would prefer fresh, larger berries, but, for what it was, it was fine, although I likely wouldn't pick it again. The hazelnut cream cheese was great. Little bits of hazelnut, tons of flavor, soft and spreadable like all the Panera cream cheese. I've reviewed the muffins from Panera before, but somehow, I never wrote up a review of the item I most commonly get from Panera: bagels. Are they the most authentic, delicious bagels out there? Of course not. But, particularly here in the Bay Area, we take what we can get. And I'm a sucker for flavored cream cheeses, of which Panera offers many. 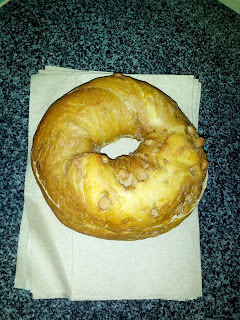 Whole Grain Bagel, Honey Walnut Cream Cheese. $2.87. One Sunday morning, I was really craving a bagel. Not something I usually care that much about, as I don't have a place in the city that I love, but I really, really wanted carbs slathered in flavorful cream cheese. I decided to try Panera. While I didn't like any of the baked goods I tried last last time I was there, I did recall their bagels being decent years ago when I tried them, and I remembered that they had numerous flavored cream cheeses. I looked up their bagel flavors online before heading to the shop, fully intending on getting either the french toast or the cinnamon crunch bagels. They seemed to be the most popular, and get pretty great reviews. And when I saw them in person, they looked just as decadent as everyone described. But ... something went wrong just as I was about to order. I realized I really, really didn't want something sweet. I know, I don't get it either. I love my sweets. I asked the girl taking my order if the french toast bagel was really sweet. "Oh yes, it is incredibly sweet. It is basically just syrup. They should call it the maple syrup bagel instead of the french toast bagel." Hmm. So, I totally changed my plan, and went for perhaps the most boring, and complete opposite thing imaginable: the whole grain. Yes, really. Like I said, I don't know what had gotten into me! I couldn't even tell you the last time I had a whole grain bagel when given any other choice. I was in a weird mood. At least I paired it with a sweet cream cheese, the honey walnut. I figured the whole grains and honey flavors would go together nicely. Described as "made from whole spelt flour, millet, flaxseed & other wheat flours, sweetened with honey & topped with rolled oats." It turned out to be exactly what I was in the mood for. Hearty tasting, with little bits of seeds and whatnot inside, giving it an interesting texture as you bit in. I really liked the rolled oats on the outside. It didn't really have much sweetness to it, which was fine with me. 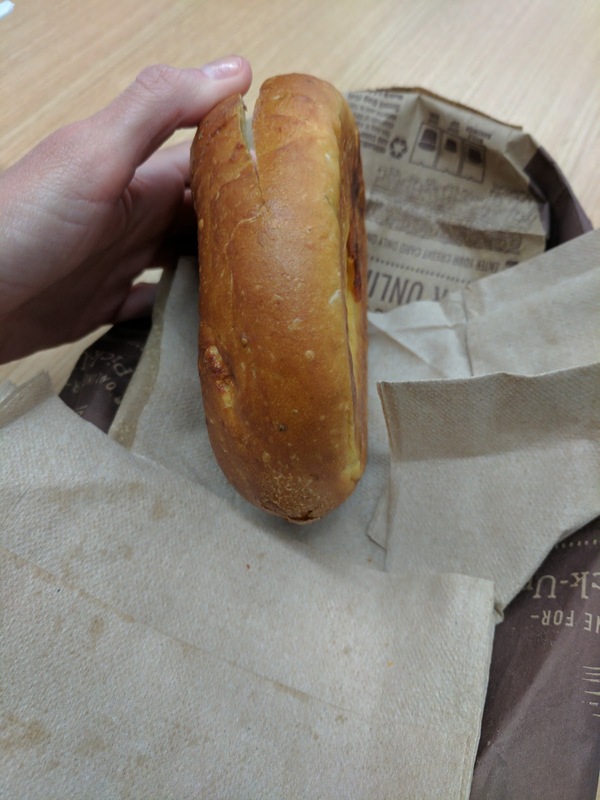 Since I wasn't that hungry, I asked to only have half toasted, so I could take the other half home with me to eat later. It was decently toasted. I generally find bagel places under-toast for my liking, so I was happy to see it actually got a bit crispy. 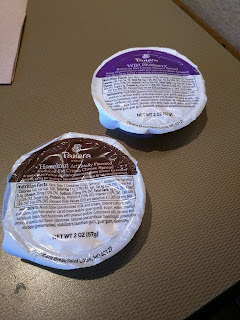 Even when you dine-in, the cream cheese comes in a little sealed container. I like that they don't apply it themselves, so you can put on the amount you actually want, but it seems funny to slice and toast your bagel for you, and then give you packaged cream cheese on the side. I took the other half home and toasted it, and I decided to try other toppings. I tried it 4 different ways, since I couldn't decide on what I wanted. Yes, it was just half a bagel, so I cut it into quarters. The first way I tried it was with my favorite peanut butter melted on. That was actually pretty tasty, and the hearty flavor of the grains went well with the peanut butter. The next segment I did with peanut butter and my mom's homemade strawberry jam, as I figured PB&J was better than just PB. It turned out I was wrong, and liked it more with just the melted peanut butter. Next up was butter and cinnamon. Lots of melted butter. This actually brought out the honey flavor in the bagel itself, and was lighter feeling than the heavy peanut butter. It also inspired version #4: honey! I know, I wasn't in the mood for sweet earlier, but I'd changed my mind by this point. The honey and the oats and the grains all were perfect together. This was my favorite version, but very simple. I'm not sure I've ever had just honey on a bagel before. Anyway, it was a good enough bagel. Not something to dream about, but if I wanted a bagel, I'd go back to Panera. I'd probably try other flavors, like the sweet ones, or the blueberry, but if for some reason the mood struck for a hearty bagel, I'd get it again. The plain bagel is $1.25, the 2 ounce cream cheese container an additional $1.39. Price seems a little higher than most cafes, mostly for the cream cheese, but not that high. "Freshly baked bagel made with pumpkin and spice, topped with a blend of crumb and cinnamon crunch topping and dusted with powdered sugar." This was a strange bagel. For starters, it didn't have a hole. I tried a bite of it at room temperature, plain, and I was highly unimpressed. Sure, it was pumpkin flavored, but it was mostly just dried out bread. But then I toasted it, and added copious amounts of butter. It was much better! Warm, pumpkin bread, with some sweetness to it. Decent spicing. The butter added much needed moisture. On top was a tiny amount of the "crumb and cinnamon crunch topping", but honestly, it was a fairly lame amount. I would have certainly liked more, but perhaps that would have pushed it too far into the dessert category? The powered sugar did a good job of sweetening things up just enough. "Freshly baked bagel made with sweet maple flavored and cinnamon chips." Inspired by the pumpkin pie bagel, I went for another sweet one, the french toast. I love french toast, so this sounded great in name, but I also knew that it was a bagel, not actual french toast. Like the pumpkin pie, I first tried a bite plain to evaluate it. Again, just dried and meh. Once toasted, it improved, but I still wasn't much of a fan. It smelt amazing, like french toast indeed. Or, at least, like cinnamon and maple syrup. But there just wasn't much flavor. I soaked it in butter, and it was better, but still not great. I even, uh, dunked a piece in whipped cream, but that didn't help. I wouldn't get this one again. Dry, not that flavorful. But, decent cinnamon flavor, and a nice crunch on top.